Wrapp, a social gifting service backed by Greylock Partners and Atomico, is crossing the pond with the U.S. launch of its mobile gift card and retail app. Wrapp, which was available previously only in the UK, Norway, Sweden and Japan, Wrapp is actually launching today with a number of U.S. retailers including Fab, Gap, H&M, Sephora, The Wall Street Journal, Wayfair, and others. As we’ve reported in the past, Wrapp was co-founded by Rebtel and SendIt founder Hjalmar Winbladh, Spotify founding CTO Andreas Ehn, and lets friends give, receive and redeem digital gift cards using mobile devices, and allows friends to contribute to gifts given by mutual friends. With Wrapp, which offers iPhone, Android and web apps, you sign in via your Facebook account, and you can then tap the Celebration tab on the app, browse your friends or major events, and select the person you want to send a gift card to. All available gift card offers for that friend are automatically listed. You can then select the retailer and the gift card offer you want, write your celebration greeting, select a delivery date, enter payment details (if you’re contributing extra funds to a free gift card), and send the gift. Your friend will be notified and celebrated through Facebook and the Wrapp application. Merchants can actually specify the amounts they’d like to offer via the service, and target specific demographics of users with gift card options, which is something other online social gifting options don’t allow. To collect a gift card you click on the link sent to you in email, text message (SMS) or on your Facebook wall, which lets the user automatically download the Wrapp app. To use the card, you select the card you want to redeem, and then show the resulting barcode to the cashier, which then gets scanned to complete the transaction. For merchants and in-store retailers, says founder Winbladh, Wrapp is an ideal way to connect with potential customers because it not only allows them to target specific users by demographics, but also provides a valuable form of advertising. Winbladh says that while he’s always been bullish on mobile, in 2008, he started observing the increased pressure on brick and mortar retailers and was thinking through the ways that retailers can drive people in stores. He and his co-founders sought out to reinvent the gift card market to help drive traffic for retailers. He believes the gift card, which has gone through little innovation to date, can be made social, viral and mobile. And the service seems to be gaining traction amongst both consumers and retailers. Participating merchants report that each sale averages four to six times the value of the free gift card they let Wrapp users give to their friends. In December alone, Wrapp users used the service to buy 250,000 gift cards. And the app went viral in the country, with 2 percent of all Facebook users in Sweden downloading the app. After three months live in Sweden, one percent of the Swedish population had interacted with Wrapp. During the last four months more than 165,000 people have given their Facebook friends over 1.4 million free gift cards that could be redeemed in stores operated by nearly 60 major retailers in Europe. A launch in the U.S. could be a turning point for the company. As board member and Greylock partner Reid Hoffman tells us, for the vast majority of Internet companies, the degree with which they succeed is determined by how well you an do in the U.S. But he believes Wrapp is in a perfect position to potentially reach critical mass, and create a network between retailers and consumers at a high volume. 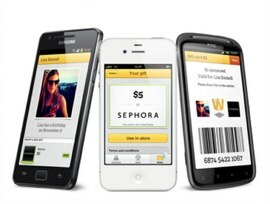 “Retailers know that they need to move towards retail 2.0; and Wrapp provides this valued experience,” Hoffman tells me. And because of the upswing in consumer use of smartphones and social network, Wrapp is in a prime position to gain traction amongst shoppers. There are other players trying to shake up the gift card market with mobile technologies, including recently launched Karma. But what’s compelling about Wrapp is the win for retailers in helping drive traffic in-store and being able to target certain user based upon social and demographic data provided by Facebook. What’s next for Wrapp? We’ll be seeing a number of more big-name U.S. merchants announced in the next few months, says Winbladh. We’re told that more than 15 additional U.S. merchants are now scheduled to start using Wrapp in the coming months. And we’ll see the company expand to other countries as well.